Julian Lang is a member of the Karuk Tribe (northern California) with Wiyot and Konomihu Shasta ancestry. 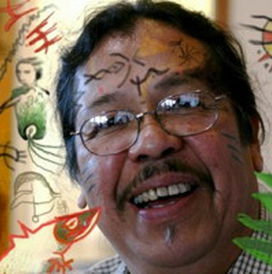 He currently lives in McKinleyville, California with wife and cultural work partner, Native artist and leader, Lyn Risling.Lang has taught the Karuk language since 1980 when he started teaching under the mentorship of Shan Davis. He also teaches traditional singing and has taught more than 500 people a wide range of traditional songs with assistance from Lyn Risling. He is a highly sought after traditional storyteller. He currently teaches a language class 2 days per week which is being documented by Crystal Richardson, language student, under a grant from the Endangered Languages Institute. His classes were initially taught using the Accelerated Second Language Acquisition technique, also known as the Grey Morning method which relies on images and immersion to teach. Today his teaching methods include the Grey Morning method and several additional approaches all aimed at getting the students to acquire language skills, to exercise the acquired skills, and then to encourage conversation/communication. A newly established website is planned devoted to teaching and learning the Karuk language. According to Lang, the website will be based on development of content at the beginner, intermediate and advanced speaker levels.